Below is a brief description of the Subaru Limited Warranty for 2013 model year Subaru vehicles that is provided to each buyer by Subaru at no additional charge. Please see your Subaru Dealer for the 2014 Warranty. 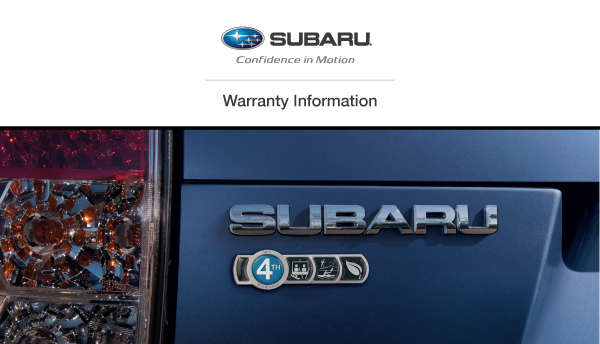 Your Subaru Dealer has complete details concerning the warranty and any exclusions and/or restrictions that may apply. Please visit your nearest Subaru Dealer for this further information. Repairs at no ChargeDefective parts will be repaired, or at the option of SOA or your Authorized SUBARU Dealer, replaced with a new or remanufactured parts without charge to you for labor and materials.